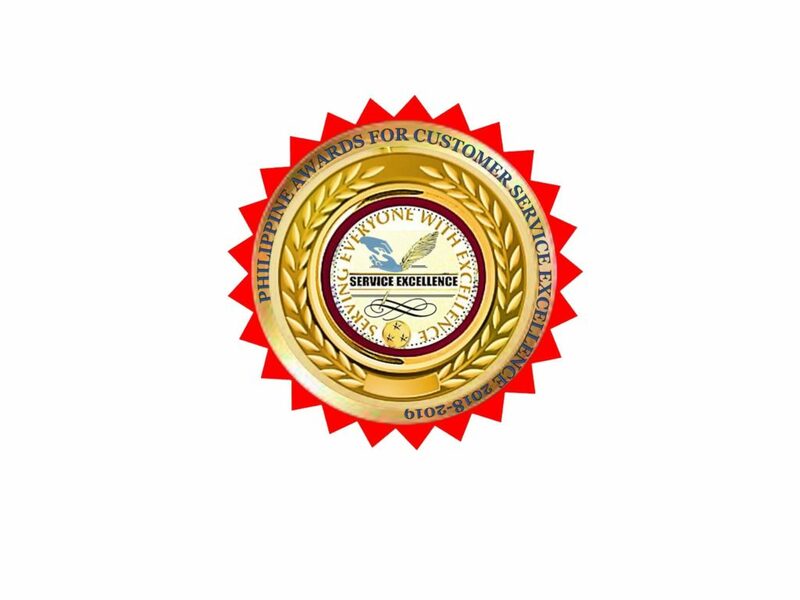 The Philippine Awards for Customer Service Excellence is an annual systematic and ongoing individuals and companies recognition program intended to give recognition and empower them to encourage extraordinary customer service. They have created criteria to evaluate candidates using the following. SAFETY – how products and services supplied by a company delivered in a safely manner and ensure that the products should pass the Product Safety Standard. RELIABILITY – the probability that a product, system or service will perform its intended function adequately for a specified period of time, operating in a defined operating environment without failure. COURTESY – to ensure that customers should be treated politely or shows a respectful attitude. It is vital in building a good customer relationship. COMPETENCE – the ability to do a job successfully or efficiently is a vital ingredient to meet or surpass customer satisfaction. 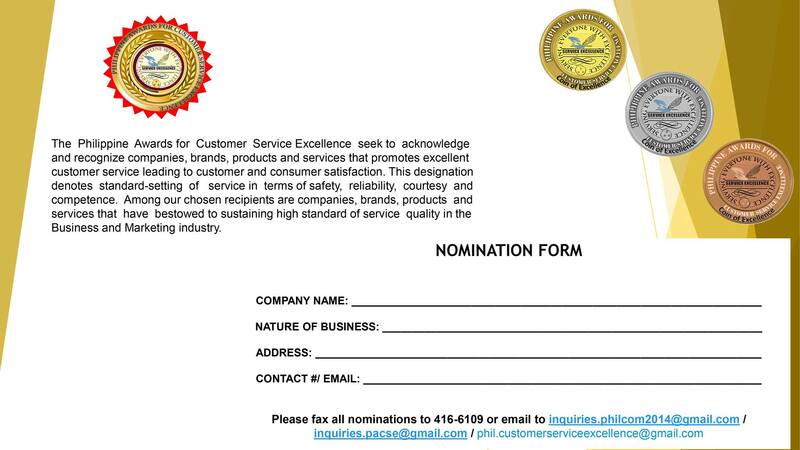 Who will be this year’s PHILIPPINE’S CUSTOMER SERVICE EXCELLENCE AWARDEES and OUTSTANDING ENTREPRENEURS/ ACHIEVERS? 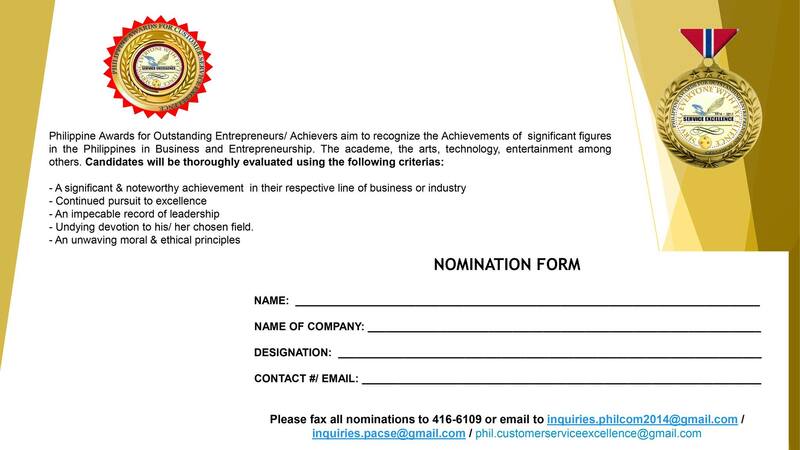 Nominations are still being accepted for the year 2018-2019 PHILIPPINE AWARDS FOR CUSTOMER SERVICE EXCELLENCE & OUTSTANDING ENTREPRENEURS/ ACHIEVERS. An increasing number of companies, brands and individuals are confirming for the awards, If you know of any company or business who deserves the award please nominate them. Nominate your candidates deserving of this recognition. 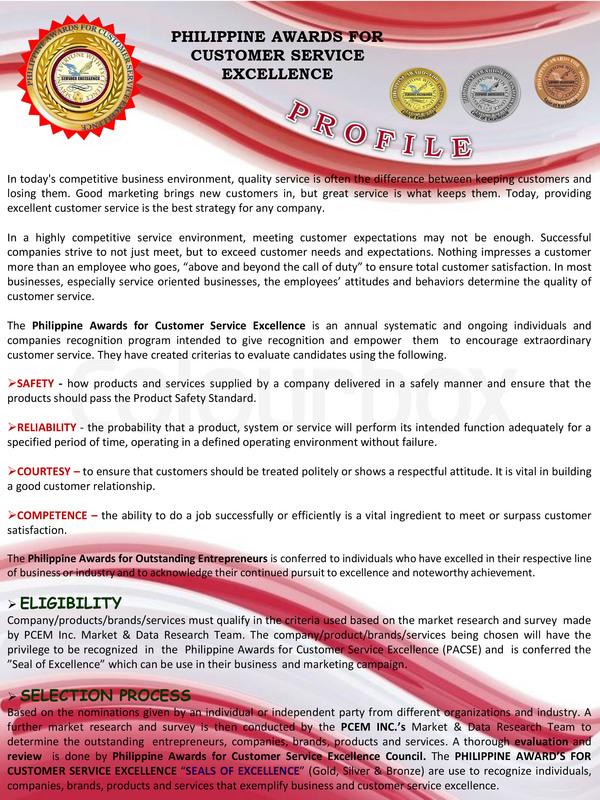 For inquiries and sponsorships, please email us at phil.customerserviceexcellence@gmail.com or inquiries.philcom2014@gmail.com.